Why is it unlikely possible for Bulgaria to become a testing ground for the newly created Energy Union? In the middle of the 20th century Sir Winston Churchill had already called the Balkans as "Europe's soft underbelly". Since then, unfortunately, little has changed, and these unflattering comparisons were already used countless times. Again, there is an article in such an authoritative source of international news as "Financial Times" under the same title:” The Balkans are the soft underbelly of Europe”. This time an old unpleasant epithet is applied to the Balkans in the article of Bulgarian political scientist. Even so, it is doubtful whether the majority of the Balkan countries agree with this characteristic. As for Bulgaria, the political scientist is right saying so about his own country. Unfortunately, Bulgaria has turned out the weakest link in the chain of partner countries, which have taken a consistent position for several years pursuing their national interests in strengthening its own, emphasize once more, its own energy security by means of participation in the South Stream project. Bulgaria experienced the most intense political pressure. There was no other partner country taking part in the South Stream project implementation visited by so many high-ranking policy makers from Brussels and Washington. Ultimately, Bulgaria did not sustained, turned backwards under that political pressure and blocked the South Stream pipeline by not issuing construction permits. Since then, the opponents of the South Stream pipeline are pleased to repeat that the cancellation of its construction reducing Moscow's influence. But the problem is that this so-called "influence reduction" did not move the Balkan countries any closer to solving pressing economic issues, which require a drastic improvement in energy supply. The Bulgarian political scientist called the Balkans just a "EU's backyard" in his article in FT. Nevertheless, it should not mean that EU citizens living there do not need modern and stable lighting and heating, environmentally friendly transport, etc., do they? Almost nobody conceals now in Europe that Russia's refusal to construct the South Stream gas pipeline came as a total surprise. As if the EU did not do its utmost to slow the commencement of its construction until the very last day apparently not expecting it really can happen. An awareness about what had really happened appeared only when Russian President Vladimir Putin stated about cancellation of the South Stream gas pipeline. Before that neither in Sofia nor in other European capitals, obviously, such a scenario was not considered. That is why the Prime Minister of Bulgaria Boyko Borisov had urgently to leave for Brussels to consult with the European Commission Vice President Maroš Šefčovič. The Prime Minister brought to Brussels a proposal to build a gas hub in Bulgaria, which could be a part of the infrastructure necessary for implementation of plans for creating the Energy Union. Meanwhile, there are still doubts that the idea of this gas hub originally belonged to Bulgaria since before that the country's leadership did not demonstrate enough initiative often proving appropriateness of Churchill's characteristic with regard to the Balkans mentioned above. However, it does not matter who invented the idea of constructing a gas hub in Bulgaria. Another thing is much more important. This idea resulted from the necessity of providing the society with convincing arguments that, despite the problems with the South Stream pipeline, there are some alternative projects for energy development and, therefore, the loss is not so great. But there is an understanding as well as more or less concealed annoyance in the majority of the Balkan countries that in fact they will encounter a significant loss of future benefits because the project cancellation postpones real opportunities of increase in energy consumption by several years. Meanwhile it is necessary to consider not only energy problems, but also missed out huge investment gains. Russian Gazprom invested in the Nord Stream pipeline through the Baltic Sea, and it was supposed to be with the South Stream as well. Joint project companies were created for implementation of onshore part of the South Stream pipeline in all countries - partners of Central and South East Europe. For example, South Stream Bulgaria is a joint-venture company established to manage the project in Bulgaria, owned equally by Russia's Gazprom and the state-run Bulgarian Energy Holding (BEH). In August last year South Stream Bulgaria joint venture raised its capital to 397.6 million Levs (about 200 million Euro). Having abandoned the South Stream project Gazprom stopped investing into development of the EU gas transportation infrastructure. More importantly, this decision marked the beginning of radical changes in the strategy of the Russian company, which before was primarily focused on gas deliveries to the countries of end users in the European market. In this regard, the head of Gazprom Alexei Miller stated after the talks in Moscow with the European Commission Vice President Maroš Šefčovič on 14 January that the new Gazprom strategy in Europe would be built in compliance with EU plans for creation the Energy Union that envisage centralizing purchases of Russian gas. In this regard, Gazprom intends now to construct new pipelines for delivering gas up to Europe's borders only. Especially it concerns a new gas pipeline Turkish Stream announced simultaneously with the cancellation of the South Stream, which is considered as its direct successor. The new pipeline to Turkey will have an annual capacity of 63 bcm and will include a gas hub on the Turkish-Greek border specially constructed for customers in Southern Europe. It turns out that Russian Gazprom purposely changed the new gas transmission infrastructure to make it consistent with the model of the future Energy Union, which has become one of the top priorities of the new European Commission team. The European Commission Vice President Maroš Šefčovič said it is expected that the concept of Energy Union is to be presented in February 2015. The Concept of Energy Union will include infrastructure projects aimed at building a single internal energy market. However the question is whether the gas hub proposed by Bulgaria is included in the Concept of Energy Union? Probably not, and in future Bulgaria will be receiving gas from the Turkish gas valve since an opportunity of taking a position of the major Balkan hub on the South East border of Europe was missed forever. Because without the South Stream there is no gas in Bulgaria to distribute and to transit. "Gas hub does not make sense without Russian gas, "- said the former Bulgaria’s President Georgi Parvanov on the construction in Bulgaria a gas distribution hub instead of the South Stream pipeline. Obviously, the chances to build a gas hub in Bulgaria on the EU money are very weak. 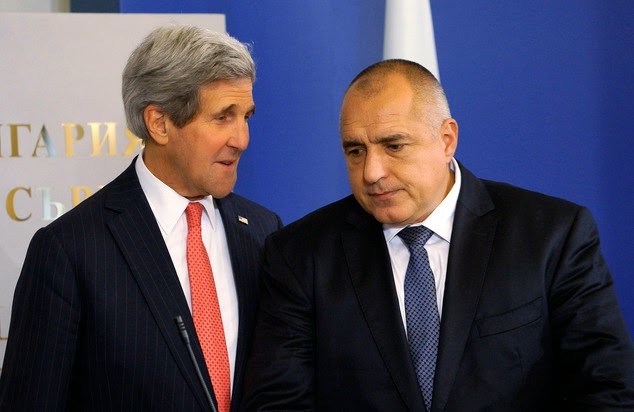 Furthermore, there will be no financial support from Washington as it became clear after US Secretary of State John Kerry's visit to Sofia, when he announced plans just to send the top US energy official and no more. Therefore, Bulgaria is unlikely to become a testing ground for the implementation of a new model of the Energy Union, acting as a gas intake and transit facility for the EU gas imports. Now Bulgaria is offered another role clearly defined in the article of well-known American edition «Foreign Policy» on January 16 under the title: "Bulgaria Is the New Battleground in Fighting Russian Energy". No wonder as far as Bulgaria has served against its own energy interests and now the country will be getting so called anti-gas bastion rather than a gas hub. Why does it happen that actually the fight against real energy projects, which are capable to strengthening energy security, is presented as an undeniable option? Why did it suspend improving the quality of life especially by means of achieving for that a required level of energy consumption in EU countries?